Sorry to have been away for so long. I got a new job in a different city that required a lengthy move so I took a few weeks off. Don't worry, though, things are back to normal here at NoaF with regard to games. This week we're still in a lull when it comes to new games so I decided to take a look at some games genres I haven't played for a while. Other than Blur, I don't think I've played a racing game in years so I decided to go with the fourth installment in the Forza series this week. It was roundly lauded and got a 91 on metacritic, so I was fairly assured of a quality gaming experience, and Forza 4 didn't disappoint. There are over 400 cars in Forza 4, including this beautiful Ford GT that I picked up earlier in the week. It's an over-powered beast that is hard to control on turns, but what fun I had trying to keep it in line! The game starts you out as the previous iterations did with 4-cylinder hatchbacks and little bumper cars. It's akin to the training levels on other games, preparing you for the higher levels and faster cars. The game offers everything from little put-around cars like the above to Ferrari Gallardos and Formula 1 racing cars. Half of the fun is in upgrading little hatchbacks to the point they can take on Ford Mustangs and Pontiac GTOs. The other half of the fun is actually leveling up enough to drive those pieces of American muscle. The only downside to the car selection in this game is the lack of Porsches. I've always wanted a Porsche in real life and I'm afraid games are as close as I'm going to come. Unfortunately just not in this particular game. That said, it's got a wide enough selection to keep you constantly entertained. The game itself is very similar to previous versions of Forza, just with more polish. As you can tell from the pictures, it's about as close to realism as a game can come. The designers call it "photorealism." I call it impressively awesome. The sound quality is a significant step up from Forza 1 and 2 (I never played 3). You can even tell a difference in the engine noise when you add upgrades to your cars. The tracks are all real and include some of the most famous pieces of pavement on the planet. On the one hand, the realism is second-to-none. On the other hand, I wish they would have added some more tracks to the library because I felt like I'd played over half of them before. It was nice to remember when a turn was coming or where a good spot to pass was located, but it felt strangely like I'd already played the game before. Deja vu isn't a sensation that most games strive to acheive, but Forza 4 had it in spades. If you enjoy racing games, I highly recommend you give Forza 4 a try if you haven't already. I picked it up for thirty bucks at Best Buy and you can probably get it even cheaper used. You can upgrade your cars piece-by-piece or use a simplified upgrade mode (for the non-gearheads among us) that makes all those decisions for you. It doesn't have quite the depth that Gran Turismo has in this area, but if you don't know a head gasket from a headliner like me, it's not that big of a deal. I had fun getting back out on the track and playing with a bunch of toys I'll never be able to afford, and you will, too. 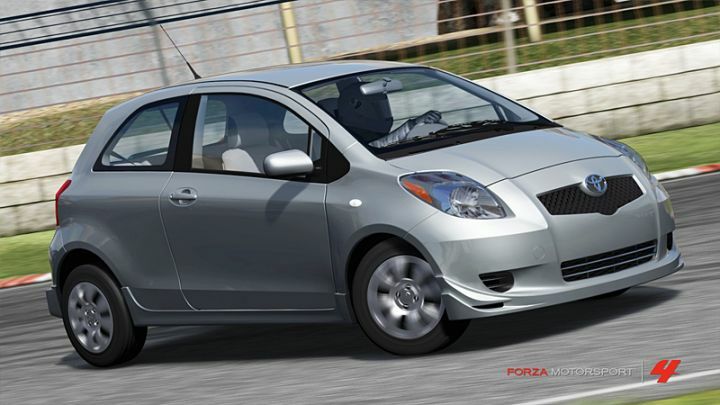 Check out Forza 4 if you're looking for a way to pass the time until GTA5 comes out. You won't be disappointed. Bonuses: +1 for the unbelievable realism. When it comes to bringing the experience of driving to a console, they nailed it. Penalties: -1 for not having Porsche on their list of cars. I'm assuming they have an exclusive deal with Gran Turismo or something. Even so, I was disappointed to not see the legendary autos in the list of possibilities.